A little over one year ago conservation lost one of its finest and both the Osa and Corcovado National Park lost their greatest champion. The founding of Corcovado National Park, the so-called jewel of the Osa, and other national parks was spearheaded by a few tenacious conservationists and visionaries, among them Alvaro Ugalde Viquiz. 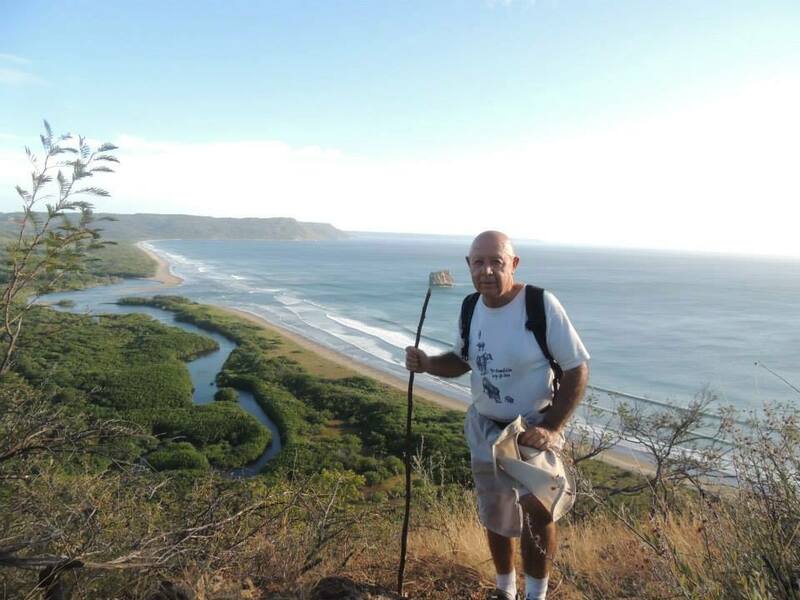 The contribution Alvaro Ugalde made to conservation extends far beyond this one park and the Osa – but he made no secret of the fact that Corcovado was his favorite park and the Osa was his most cherished place in Costa Rica. To that end, he stayed involved as a board member of Osa Conservation and continued to be a voice advocating for the protection of the Osa until his final days. Both the parks and the man behind them hold a place in history and in the hearts of many in Costa Rica and abroad. Alvaro’s legacy will be celebrated by furthering his work and his vision of empowering others to make a difference in the fight to protect Osa’s biodiversity and ecosystems. With the support blue moon fund and other individual donors, Osa Conservation created “The Alvaro Ugalde Scholarship Fund” as a means to engage young people in conservation of the Osa. 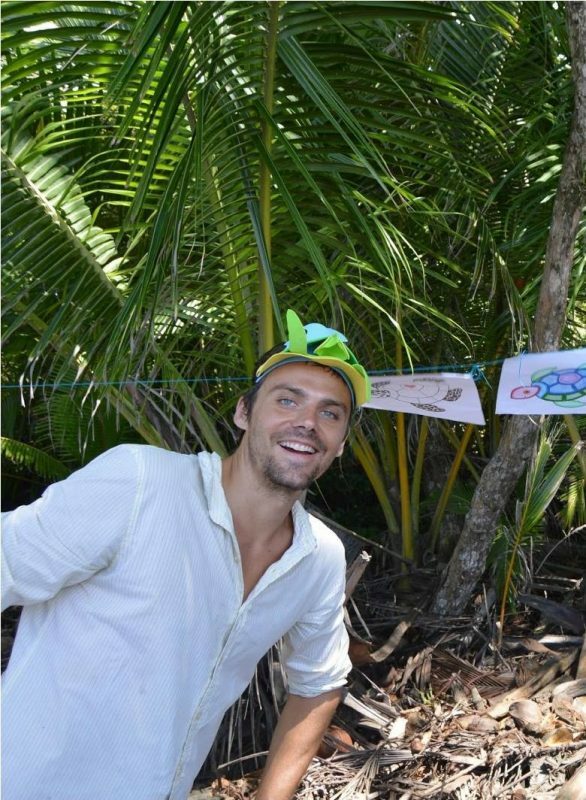 The scholarships will enable young people to work side by side and learn with conservation biologists, environmental educators, community activists and other stakeholders working to safeguard the future of the Osa Peninsula that Alvaro so loved and dedicated his life to. We are very proud to announce this year’s recipients of the Alvaro Fund Scholarship Award, Cristian Castillo Salazar, Phoebe Edge, and Laura Robleto Villalobos. Cristian Castillo Salazar is dedicated to bat conservation and will study how humans living in urban environments have impacted the local bat population. He intends to determine the most effective artificial shelters for these bats living in urban areas and to educate the community of La Palma via workshops and presentations about the importance of bat conservation on the peninsula. 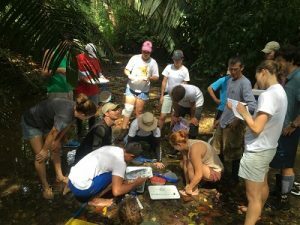 Phoebe Edge will provide important technical training in data collection, biological inventory techniques, and environmental stewardship to students in a variety of studies. 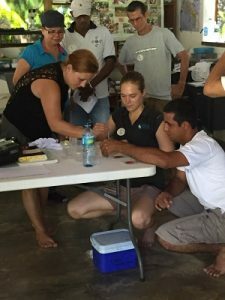 Students will learn routine research principles and maintenance in the sea turtle hatchery on Playa Carate and provide COTORCO with much needed assistance on nightly beach patrols. 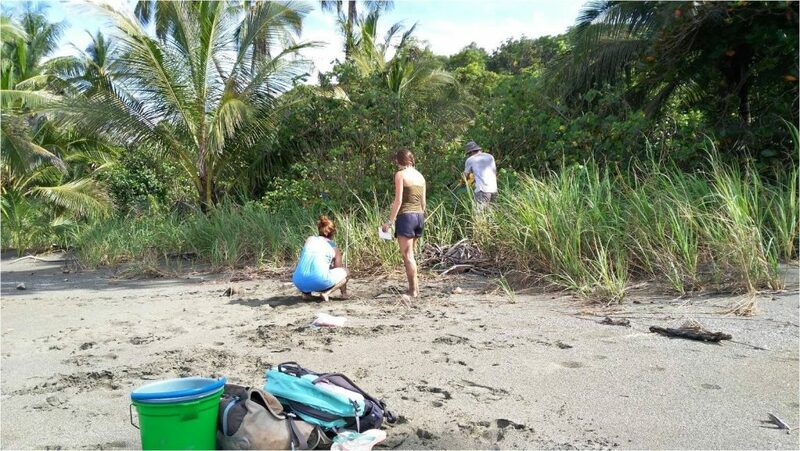 Laura Robleto Villalobos will use her award to purchase a GPS unit to document the land cover in Rincón National Park subwatershed. She would also like to integrate with a GIS (geographic information system) and obtain water quality data. Using this information, Laura will be able to make suggestions for land use that will benefit the water quality of the Rincón River basin and create a conservation model that will be able to benefit other basins in the Osa. The world has recognized that there is a new major environmental concern: the decrease of multiple bee species. This is extremely concerning because of the vital roles bees play in pollination. However, bees are not the only species suffering – there is an overall decrease in pollinators. 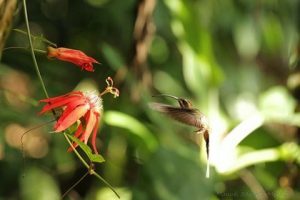 Other such pollinators include butterflies and some species of vertebrae (hummingbirds, bats, etc). The U.N. has shed some light on the dilemma in a recently released report that analyzed 3,000 scientific papers. From the reports, they concluded that 40% of invertebrate and 16% of vertebrate pollinator species are at risk for extinction. Pollinators are important from two main standpoints. First, food security is weakened when there are fewer pollinators. One third of all agricultural output depends on pollinators. The UN report found that 75% of the world’s food crops depended, at least partly, on pollinators. This statistic translates into $235 billion to $577 billion worth of global crops being affected. Such crops include chocolate, coffee, apples, and almonds. Sadly, these impacts are not just projections for the future, they are happening now. China, for example, has already experienced food insecurity because of the sharp drop in pollinators from pesticides. To try to counteract these impacts, they have resorted to hand pollinating the apple trees. The impacts are also visible domestically. In California, many farmers needed to rent bee colonies to ensure that their almond crops remained healthy. These effects will negatively impact food prices as a whole, especially in developing countries. Pollinators play a vital role in the food chain and support a habitat’s biodiversity. When plants are not pollinated they are unable to reproduce and this inability causes plants to produce less and eventually to go extinct. Plants serve many important purposes for the environment and their extinction would be catastrophic. They are used for medicine, decreasing erosion, as well as being the beginning of the food chain as energy for primary producers. The UN cites many reasons for why the pollinator populations are decreasing. All of them appear to be human related. IPBES Vice Chair Robert Watson found that the primary causes are due to “changes in land use, intensive agricultural practices and pesticide use, alien invasion species, diseases and pest, and climate change”. The intensive agricultural practices are replacing more sustainable indigenous practices which help to protect numerous habitats. Then, there is also the issue of global trade allowing for the spread of invasive species and diseases. However, there are possible solutions to this dire situation. We need sustainable farming practices to ensure a healthy pollinator ecosystem and secure food production. Both directly impact our well-being and health. There are such options such as pesticide control, which is relatively easy to do. The UN report also cites options such as adopting indigenous and local farming techniques, with an emphasis on diverse habitats for sustainable agriculture, crop rotation, reduction in pesticides, and improving bee husbandry. We just wrapped up the peak sea turtle season here in Osa and are proud to announce that this year we released over 20,000 baby sea turtles! 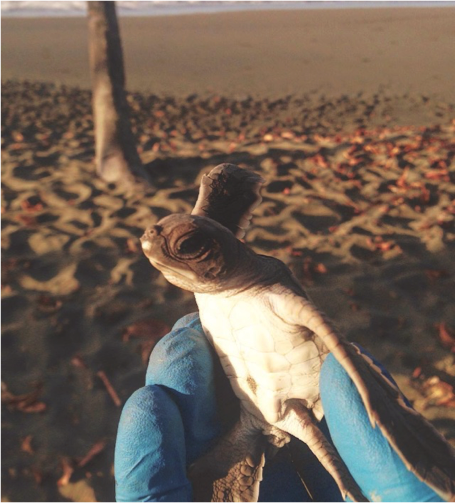 The hatchlings were from nests relocated to our hatchery because they were vulnerable to predation or to the whims of the river that runs along and often through the beach OC monitors. Since these nests were likely to have been lost altogether, our hard working volunteers and staff have given 20,000 more sea turtles a chance to make it in this world. A huge thanks to everyone who visited and lent a hand this year on the Osa Conservation Sea Turtle Conservation Program. 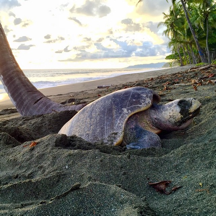 In this weeks blog, we hear from a long-term research assistant about his surprise discovery one morning at the sea turtle hatchery. In the early hours of the 2nd November 2015 a clutch of 82 Green Turtle (Chelonia mydas) eggs were laid by a female on Piro Beach. This would be the first Green turtle nest to be relocated to the hatchery this year. The overwhelming anticipation to witness the first green turtle hatchlings was endured for 63 days until the joyful day arrived on the 4th January 2016. My name is Charles Wheeler and I am one of the research assistants for the Sea Turtle Programme at Osa Conservation. I was scheduled for the morning patrol on this day and was expecting a normal routine patrol on the beach with the possibility to release some Olive Ridley (Lepidochelys olivacea) hatchlings, the most abundant species of turtle eggs within the hatchery. After patrolling the beach and recording three new Green turtle nests, I arrived at the hatchery. I open the door to find some escaped hatchlings crawling around, at first I noticed something different about the hatchlings they were larger and had white bellies. After a few seconds of confusion I realised these were in fact the green turtles and they had hatched seven days early. Unable to control my excitement like a small child on Christmas morning, I hurried around the hatchery collecting all the hatchlings and placing them into buckets. 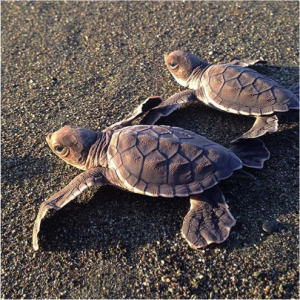 There were a total of 50 Green turtles as well as 70 Olive Ridley hatchlings that had emerged over night. Knowing that this was a rare opportunity to release fifty green babies I couldn’t just stay and liberate them myself. So I left the turtles safely secured inside the hatchery and ran from the beach back to the station 1.6km away to tell everyone else the great news! Being able to watch the liberation of these two endangered species gives immense job satisfaction and I am proud to be a part of this conservation programme protecting these international species. You may have seen Charles on our Facebook page recently when we shared a selfie he couldn’t resist snapping after coming across a rebellious sea turtles that decided to nest during the day, breaking all the rules. If not, check it out at this link and like our page to follow us. There’s something about measuring squirming sea turtle hatchlings that automatically puts a smile on my face. But this batch of babies was extra special. They were from a nest that I relocated on my very first patrol on Piro, way back in the beginning of September. A little over fifty days later, and the ping-pong shaped eggs I once placed in a bucket and buried in the hatchery had resulted in one hundred flipper-flapping babies. I was enthralled. Flash-forward two hours later, when my fellow Research Assistant Erin and I were leaning against a palm tree outside of our vivero de tortugas marinas (sea turtle hatchery) and reading. We were waiting on the arrival of a large group of college students and Osa Conservation employees to help us liberate our new hatchlings before sunset. As Casey (the other Sea Turtle Research Assistant in our group of three) whistled, I craned my neck around to say hello. But to my surprise, Casey wasn’t the only one demanding attention. A female Olive Ridley (Lora) was slowly hauling her body up the sandy embankment in front of me to lay her eggs. It looked as if she was using her two not-so-terrestrial but powerful front flippers to head directly to where I sat, which also happened to be directly in front of our hatchery. And it was 4:00 in the afternoon. Olive Ridleys are in fact known to lay eggs during daylight, but typically in large groups called arribadas (meaning “the arrival” to the people where this phenomenon occurs). However, arribadas do not occur on Piro, or anywhere on the Osa for that matter. The female in front of us was clearly alone. Fifteen minutes later, she was hard at work digging her nesting hole, and the rest of our party had arrived to share in this incredibly rare and special moment. Afterwards, over three hundred babies released from our hatchery scrambled across the sand, parallel with the tracks our afternoon visitor had left. They safely entered the waves, illuminated by the setting sun. Just a few nights ago, we had another visitor at the hatchery. She was much larger and slightly more ornate; a Green turtle (Verde). And rather than having the light from a setting sun framing her, we had one of the clearest nights I have ever witnessed. Countless constellations blanketed the sky, adorned with the occasional shooting star. As we walked in the sand, the pressure from our bare feet sparked a bioluminescent lightshow: blue, fluorescent, and sparkling. I grew tired as we waited for the Green to dig her nest, but I hardly dared to close my eyes in fear of missing something. I have less than a week left here now, but moments like these will stay with me for a lifetime. Working in sea turtle conservation is a grand privilege within itself, but there truly is no other place like the Osa. On Friday and Saturday, December 11-12, Piro Station bustled with activities from the Ríos Saludables de Osa (RSO) year-end workshop. Fourteen community members from across the Osa Peninsula plus four staff members gathered for a time of sharing and reflection, re-training, and envisioning for what Ríos Saludables would like to achieve in 2016. Our workshop goals were for community volunteers and staff to get to know each other (we had several monitoring groups join us for the first time! ), to provide training and practice with all monitoring protocols, and to create a space for these citizen scientists to reflect on the first year of the RSO program as well as to share ideas for expanding and strengthening this network of stream monitoring and community education. We began the morning with introductions and then delved into learning the basics of bacteria testing and E. coli. Participants learned to plate and incubate water samples to later count and analyze bacteria colonies. Detecting the presence of E. coli colonies is especially important for streams and creeks that serve as sources of drinking water for surrounding communities. On Friday afternoon, we presented the theory and methods for our chemical monitoring. We put this knowledge into practice in nearby Río Piro, with the more experienced monitoring groups explaining and training our newer RSO members. Everyone loved watching the water samples change colors from chemical reactions during the pH and dissolved oxygen tests! A two-day workshop meant participants had several opportunities to enjoy the beautiful life and sights surrounding Piro Station. 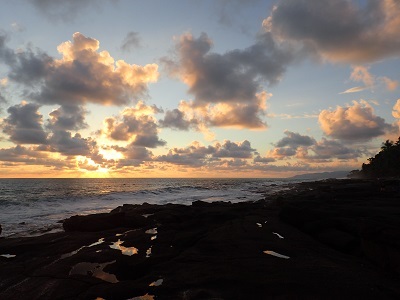 We all walked to the beach on Friday afternoon to watch a fiery sunset over the Pejeperro rocks and Pacific Ocean. 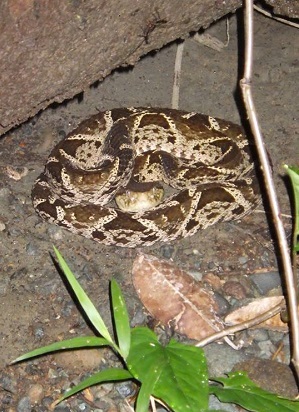 After a delicious dinner, some herpetologist volunteers (who study reptiles and amphibians) led a night walk through the stream. 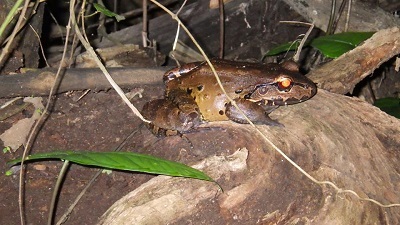 We found a giant shrimp, huge bull frog, several toads, frog eggs hanging on leaves and branches, a couple spiders and crabs, and even a poisonous terciopelo (Fer de lance) snake! For the early birds in the group came a pre-breakfast walk to Piro beach for a sparkling sunrise. While we definitely worked hard during this workshop, it was fun to also explore the ocean and rainforest surrounding us! On Saturday morning Alejandro, a wonderful colleague from the Universidad de Costa Rica, introduced the biological monitoring aspect of Ríos Saludables to workshop participants. 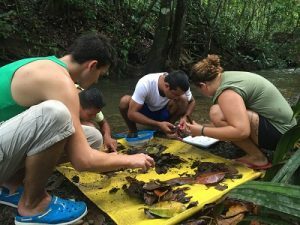 Using hand-held colanders, kick nets, and forceps, we practiced collecting and identifying over 20 species of macroinvertebrates in Río Coyunda. Among our favorite species were the mayflies, shrimp, water scorpions, and caddisflies (which can build their own homes out of leaves or pebbles!). RSO participants then learned how to record and analyze data from the macro-invertebrate sampling. In addition, Tabea presented a new online database called CitSci, which will serve as a space for RSO members to access and analyze data from their monitoring efforts. This website provides tools for comparing data across sites and over time, which will prove useful when sharing this information with local audiences and using it in advocacy to protect aquatic resources. We finished the workshop with a discussion about what monitoring groups find most important in their work with Ríos Saludables. A common interest is to expand stream monitoring and education into schools in local communities, with RSO participants serving as leaders and facilitators for these activities. 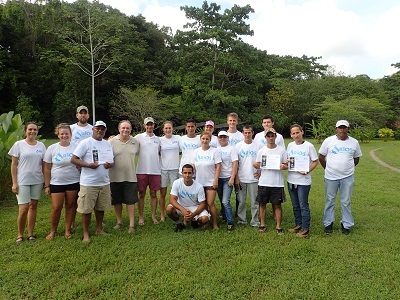 In addition, Osa Conservation (OC) staff are excited to see several RSO members willing and capable of taking on more leadership within the Ríos Saludables program. They may serve as contacts to assist newer monitors with tests and protocols, communicate with community leaders or school teachers to involve local students in RSO monitoring and other activities, and provide a unifying force to the broader network of Ríos Saludables participants. OC staff look forward to transitioning RSO towards sustainably functioning and being managed within local communities. No workshop is complete without distributing certificates of participation and beautiful new Ríos Saludables de Osa t-shirts! We are now an official united force for the conservation of and education about our Osa Peninsula streams. A big thanks to all the OC staff involved in the preparation of this workshop and to the community participants who are making this program a success! Ríos Saludables de Osa workshop completed! They say that life is what happens to you when you are busy making other plans. Read about how one Osa Conservation research assistant ended up working with us in a happy twist of fate! My name is Casey Walker and I am a recent graduate from the Environmental Studies program at the College of Idaho in the United States. Sometimes it does not matter how much you plan out your life because life has a plan for you already. I have always known that I wanted to immerse myself in the world of permaculture. The concepts of permaculture are based on both agricultural and social design principles that are wholly centered upon the patterns and features perceived from within natural ecosystems. Despite my ever growing interest with sustainable agricultural practices, my student loans were enormous. Throughout my senior year, I struggled to concoct a strategic plan to live out my dream job and avoid letting my loans hold me back. In the end, most of my plans fell through and I surprisingly ended up working as a research field assistant for the Sea Turtle Program at Osa Conservation. 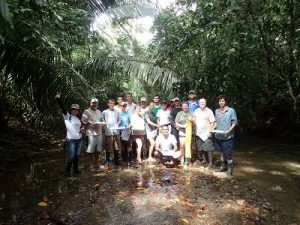 This non-profit organization is near Corcovado National Park and in my opinion has an endless amount of potential with regard towards tropical rainforest restoration. 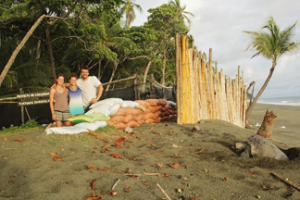 My initial plan was to fight forest fires for half of the year and volunteer for the other half of the year with the WWOOF (World-Wide Opportunities on Organic Farms) project. After about six years of this rotation I would have my student loans payed off, hopefully. This plan always made me feel uneasy though, because I don’t feel that fire suppression is very effective nor conducive to the natural cycles of temperate forest and grassland ecosystems. One day, my favorite ecology professor, Dr. Yensen, made it very clear that while he understood my financial situation he hoped that I would not “waste” my education on fire suppression. On account of my admiration for this particular professor, I began to brainstorm new ways in which I could pay off my student loans and do what I love simultaneously. Out of nowhere, I was put into touch with a man out in the Osa Peninsula who had a property near Drake bay. This man convinced me to buy a ticket out to Costa Rica in order to help him develop an NGO based upon a small scale agriculture support system for all the local schools in the area. He wanted for me to manage this project and in return he would pay me on a monthly basis. Well, long story short, those plans did not work out as imagined. Sea turtle volunteers hard at work on the beach! 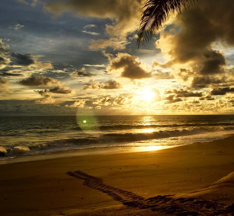 Despite the major change of plans, I decided stick around and come up with another find another way to do something positive out in Costa Rica and not let my travels go to waste. I sent out some resumes to conservation NGOs and I received a response from Osa Conservation. They were interested in hiring me as an assistant researcher for their Sea Turtle Program. I was thrilled! I immediately gathered up my things and took a bus out to the Piro research station. When I arrived I was welcomed by a friendly and professional staff and shown to my room. From that point on I have had a huge smile on my face and loads of energy on the account I am doing something that I enjoy so much. I love my job and it turns out that there is a student loan forgiveness program in the States for graduates who dedicate themselves to a US based NGO for 10 years. Other than the sea turtle conservation program, Osa Conservation just this last year launched Osa Verde, a sustainable agricultural program. There is a great opportunity to move beyond cattle grazing and produce food in a more sustainable manner according to social design principles from within tropical rainforests. 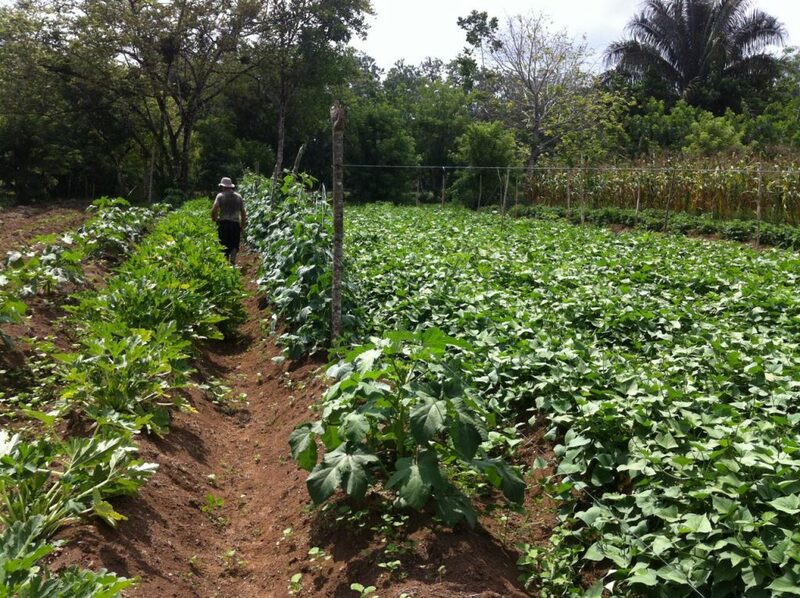 Osa Conservation’s sustainable agriculture farm, Finca Osa Verde. While working as a sea turtle researcher I plan do what I can with helping Osa Conservation attain their goals at Finca Osa Verde, and who knows, maybe one day I will be living out my real passion and work here full time growing food.